"As we were kicking around the idea of a Spock's Beard 'Best Of', the idea of having some kind of an additional track came up. I felt, as always, like it would be more exciting to do something new than to rehash something we had already done. Then one morning I got inspired and wrote the music that would become 'Falling for Forever'. It was a lot of fun writing for the Spock's gang including Ted and Nick's voices. I definitely had them all in my mind. and I think the end result is really, really cool. Al is killing it on guitar, Dave's bass tone will take the paint off your walls, Ryo is ripping on the keys as usual, and both Jimmy and Nick trade off drum solos toward the end of the song! Ted sings the choruses, Nick sings the middle section, and I sing the verses. It's truly a team effort. 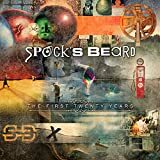 Post a review of SPOCK'S BEARD "The First Twenty Years"